"Leonardo's rule is an amazing thing," said Kate McCulloh of Oregon State University, a scientist specializing in plant physiology. "Until recently, people really haven't tested it." 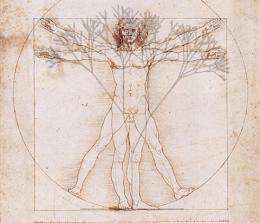 Da Vinci wrote in his notebook that "all the branches of a tree at every stage of its height when put together are equal in thickness to the trunk." In other words, if a trees branches were folded upward and squeezed together, the tree would look like one big trunk with the same thickness from top to bottom. To investigate why this rule may exist, physicist Christophe Eloy, from the University of Provence in France, designed trees with intricate branching patterns on a computer. "I designed the lightest tree structure to resist wind while still maintaining the strength of the trunk," said Eloy. Trees are fractal in nature, meaning that patterns created by the large structures, such as the main branches, repeat themselves in smaller structures, such as smaller branches. Eloy started with a fractal tree skeleton, in which smaller copies of the main branches are repeatedly added together to create the virtual tree. Each new branch takes after its "mother" branch, mimicking the fractal nature of real trees. At this stage, the model tree served merely as a framework for later determining the most effective branch thickness. Once the skeleton was completed, Eloy put it to the test in a virtual wind tunnel. After applying various wind forces needed to break the branches, Eloy determined the diameters for each branch that limited the chance of snapping. Accounting for every part from the smallest twig to the trunk, the simulation seemed to produce Leonardo's rule. Eloy found that the proportions in his model trees stayed the same regardless of wind speed or the height of the branches, as the rule would predict. His work has been accepted for publication by the journal Physical Review Letters. Still, some scientists think that there must be more to Leonardo's rule than Eloy's research suggests. Explanations for the rule generally fall into two categories -- hydrological and structural. Hydrological theories suggest trees have their characteristic shape because it's conducive to efficiently transporting sap, while structural explanations focus on trees' ability to withstand stresses. With his new research, Eloy has bolstered the structural theory. "I do not doubt that the tree structure is the outcome of a combination of hydraulics and structural constraints," Gil Bohrer, an environmental engineer at Ohio State University in Columbus, told Inside Science in an email. "However, I don't think the hydrological argument should be dismissed so easily." Regardless of the reason why Leonardo's rule holds, data collected in the field has shown that trees across many species obey the rule. While evidence so far supports the 500-year-old rule, it can be quite tedious to confirm da Vinci's observation. "The [experimental] data is very scattered," said Eloy. "If you're looking at big trees, there's thousands of branches, and it takes a lot of undergrads to measure it." Although there's little experimental data to back up da Vinci's observation, his rule has been widely used in computer graphics and mathematical art. Robert Fathauer -- a physicist and engineer by training turned mathematical artist -- has been exploring the world of fractal trees for years. He uses a process similar to that of Eloy's research to create his artwork. Fathauer uses a photograph of a single division between a trunk and a branch as the building block for his entire piece. He then repeatedly adds scaled-down versions of the original building block to the outline of a tree. While he doesn't incorporate Leonardo's rule into his work directly, the rule still crops up in his work via the photographs of real trees. "I did not consciously use [Leonardo's rule] for my art," said Fathauer. "But when I started comparing the surface areas across branchings, I found an experimental verification that Leonardo's rule works pretty well." Scientists hope further research on this rule will reveal more about wind damage, the structure of forests and the evolution of trees. "It's exciting that this area is beginning to receive more attention," said McCulloh. Book examines how trees change as they age and grow: What do these clues tell us? Not just based on hydraulics and structural constraints. What about light diffusion ? I have been thinking about this recently after observing branching that is phi-based, then reading about the spread of energy in a wave described by the Poynting vector. Also, plants create electricity by way of piezoelectric mechanics, a sure way to make up for inefficiency of photosynthesis, but the branching growth of a tree would allow for very efficient wind energy harvesting. Fractal patterns in nature always seem to optimize some variable, and often more than one. They are mixing two unrelated things. The two things are, the fractal structure of (most) trees, and Leonardo's Rule. The fractal structure arises from simply having one single rule on when to make a branch. This has enormous savings in genetic code, since you then don't have to measure long distances along branches and the trunk in order to choose which rule to implement at this potential site of branching. Leonardo's rule, on the other hand, arises from simply having "a thin pipe from each leaf to the root of the tree". This alone causes Leonardo's rule. With this kind of structure, the tree doesn't have to have a separate mechanism for keeping the trunk cross section in proportion to the total foliage area. A single species of tree has basically 4 alternatives. Either follow both Leonardo's rule and be fractal, or follow only Leonardo's rule or be fractal, or neither. Trees follow both unless there's a good reason not to. But these two rules are _not_ related. Exactly how could a tree deviate from the rule ? Having branches that have new fibers that don't carry sap anywhere from the roots ? What would happen to the osmotic pressure if the rule was violated ? This makes it to Physical Review Letters ? What a ridiculous subject of research. Some geek decided to play with tree simulation on his computer and publish an article as a result. Wow. Why not study the orientation of branch sprouts as an evolutionary adaptation to wind stresses. Now that would be useful. Leonardo's rule has no effect on when/where/how a limb branches. It merely holds that the vascular input to a section are equal to the vascular output, whether or not one or more branch point are present. In this manner it is simply a form of the Continuity Equation. Other rules will determine whether the branching follows the overall form of a blade of grass, a dogwood tree, or the fronds of a fern or palm. Could you provide a source for this? It sounds very interesting if true. Wow, someone ranked me a 1 for asking a question? What the heck? Lol, don't let comment voters get you down, they're nothing but intellectual farts in the breeze. In addition to the bits I linked, there's also research into various bamboo grasses. Also look up Electro-active papers for some interesting reading. But these two rules are _not_ related. Not necessarily. The fractal dimension in embedding space may be preserved. The dimension is constant on self-similar systems. It would moreover point to way to a single generator for the trunk and the branches. Perhaps a chemical signalling process or light diffusion constrained-optimization problem. Concentrating on the radius allows for simplification of the mathe... where trees seem to follow the simple growth equation. Where the given radius as the function R at any given height x can be expressed as a growth function G conditioned by the limiting factor m as it divides into its fractals f. where the subscript "a" would account for the growth variation due to structural support. Where the given radius as the function R at any given height x can be expressed as a growth function G conditioned by the limiting factor m as it divides into its fractals f. where the subscript "a" would account for the growth variation due to structural support for each fractal. Seems to me the question is. How to define resource allocation a in a Growth function that determines the radial growth? Seriously off topic ~ One of the things I'm interested in is testing wild animals for mathematical abilities through operant conditioning, as strange as it sounds .Basically, I think if I could provide an animal with a device that takes complex operations, breaks them down into simple functions of ,-,/,*, it would be possible for them to solve complex equations. If a squirrel can dig a hole and put nothing or something in it ( common tactic ) and come back at a later date, does this not signify an understanding of a simple probability space and conditional probability ? I'm convinced even bugs could do this. What do you think, besides " He's crazy " ? maybe I will just shut it altogether? You don't think I'll get any credit? You are right though, science that ignores truth has a foothold. The divinci link is a stretch compared to the historical genetic adaptation credit I give to ancient Maori whakapapa. Do you think my government is in on the bugs? Key's recently rushed through spying legislation suggest it is. (regard below) maybe I should.